Photo copyright resides with the original holder. It was Belfast comic, Frank Carson’s funeral today. Stephen Davies remembers that one December, Frank Carson was a guest on ‘Pebble Mill’ and afterwards went to the staff canteen. It was the day of the staff Christmas dinner, and Frank decided to join in. He had everyone in hysterics. 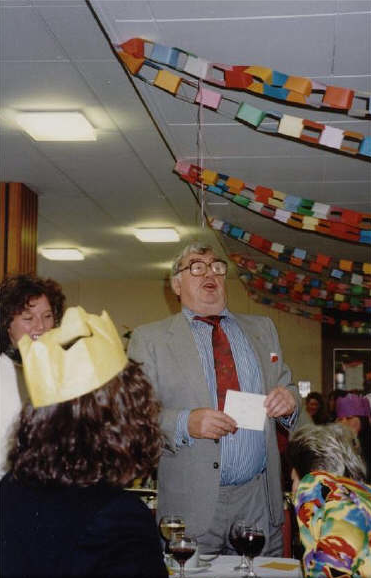 Caroline Officer remembers being the researcher looking after Frank Carson on ‘Pebble Mill’ that day: ‘When he arrived, he told me his flight back home to Blackpool wasn’t until 6pm, so we had to find something for him to do, the Christmas lunch was a Godsend. Ironically Engelbert Humperdinck was on the show too and we invited him to the lunch too, but he didn’t want to come, couldn’t stop Frank though. I was the researcher who was looking after Frank that day. When he arrived, he told me his flight back home to Blackpool wasn’t until 6pm, so we had to find something for him to do, the Christmas lunch was a Godsend. Ironically Engelbert Humperdinck was on the show too and we invited him to the lunch too, but he didn’t want to come, couldn’t stop Frank though. I love the earlier comments because since that day I’ve felt slightly guilty at disrupting everyone’s lunch. He was a lovely man, but I remember being glad to get him into the taxi and on his way to the airport – exhausting! Norman Wisdom was the same.